This recipe had a similar taste to General Tsao's Chicken found on this site but was much healthier! The recipe is good as is! I have however, made it numerous times and have adjusted a few things to my liking. I like to double the sauce, decrease the hot peppers and only use 1 teaspoon of oil. 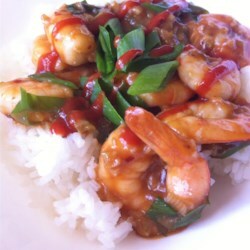 I also have found that using uncooked, peeled and deveined shrimp gives the dish a much better taste. I just cook it in the oil until opaque before adding the sauce. I just tried adding pea pods at the end, just until heated through, which was a great asian compliment to the meal. We always serve it over botan rice. A wonderful low fat, low calorie meal!